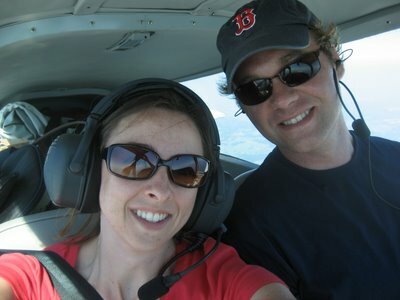 I met Jim, a flight instructor, on July 3rd to go for my checkout flight. Jim owns a Tiger with a few partners and has a whole list of credentials. He's in the Army, flies and instructs in helicopters, has his Air Transport Pilot certificate (which means he can fly 737s full of people, for example), and is on his way to a new career as an FAA Safety Inspector. Jim showed me how he conducts his preflight inspection, then we took off for some flying. We exited the ADIZ, climbed to 3,500 feet, and Jim started putting me through my paces. In slow flight with full flaps, I saw that the plane will actually fly at 60 knots, barely. A slight bank was all it took to get the stall warning chirping. Then we did some steep turns. At 50 degrees of bank, the Tiger feels like it's spinning on its wing. The controls are so much lighter than a Cessna's, it's much easier to hold altitude in a steep turn. Then we flew to Carroll County Airport (KDMW) to practice takeoffs and landings in an 11-knot crosswind. It was good practice. The Tiger is not that difficult to fly once I got my head around the differences between it and the other planes I'm used to flying. I did short and soft-field takeoffs and landings, and we simulated an engine failure so I could practice gliding the Tiger to a landing. We left Carroll County and flew to College Park Airport (KCGS) inside the Flight Restricted Zone (FRZ) around Washington, D.C. I am planning to keep the plane at College Park, but I had never flown there, so it was good practice to see the lay of the airport in relation to surrounding landmarks. 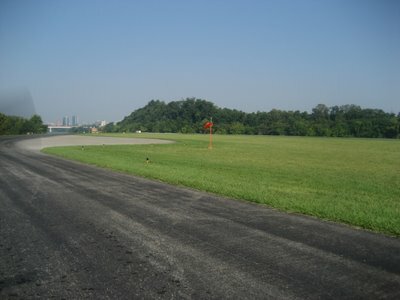 It was a hot summer afternoon, and the runway at College Park is only 2,600 feet long, with trees at both ends. With only half-tanks of fuel and just the two of us in the plane, we had no problem taking off again, but I can imagine the trees at the end of the runway growing large in the windscreen if the plane were more heavily loaded. We flew back to Gaithersburg and Jim signed me off with 2.0 hours of Tiger time. With the checkout out of the way, Jodie and I were free to go as we wished. We arrived at the airport early on the 4th of July and loaded the plane for a vacation in Tennessee. We were later than planned. Flight planning had been more complicated than usual and I had spent more than an hour early Friday morning reworking our route. 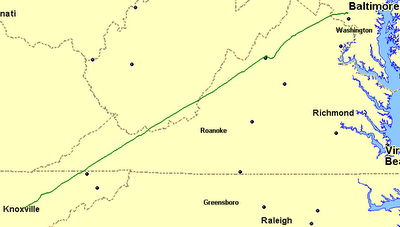 A presidential TFR (Temporary Flight Restriction) with a 30-mile radius was in place in Charlottesville, right in the middle of our route. Flying west of the TFR would be shortest, but there was a cold front coming from the west, so that would put us closer to bad weather. We also left some packing for the morning, making us even later. Then I called a Flight Service briefer to double-check my flight planning. He was very helpful and thorough, maybe even a little too helpful and thorough. It took over an hour for me to get off the phone with him, with no changes to my flight plan except the later departure time. By the time we were ready to go, it was nearly three hours later than I had wanted to leave. Instead of arriving around 11 a.m., we were departing at nearly 10 a.m., giving the cold front a chance to move further east and into our flight path. With Millie and luggage for two weeks, we took off and headed south, southeast to go around the TFR, then back to the west toward Mountain Kingdom Airport (KMKJ), where we intended to refuel and take a break. It was hazy, but the weather was okay until we approached Roanoke. The clouds were getting lower, so I descended from 6,500 to 4,500. The green mountains were beautiful not far below, but the clouds were ugly above. I called Flight Watch for a weather update. The briefer told me that the conditions to the south were deteriorating, but that there were clear skies in Pulaski, a little to the north of our intended route. Jodie and I decided that we would continue on toward Mountain Kingdom airport, but divert back to Pulaski if conditions didn’t look good when we were closer. 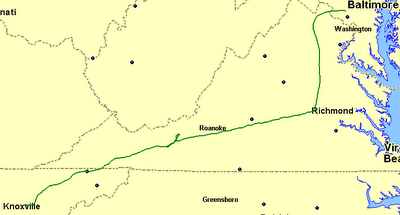 We intercepted I-81 and followed it south toward Mountain Kingdom Airport. It started to rain, but it was still VFR weather. We were about 10 minutes from Mountain Kingdom when Air Traffic Control called and asked if we had weather equipment on the plane. The Tiger has a Strikefinder, which shows lightning, but that wasn't what the controller meant. I told him we did not. He then said that there was level 3 and 4 weather over Mountain Kingdom. 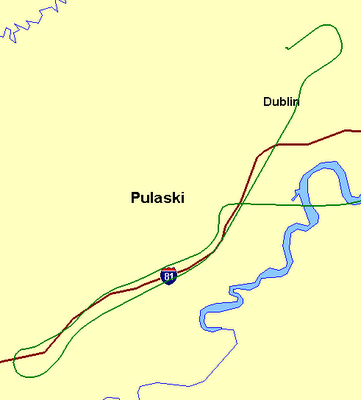 I immediately replied that we were diverting to Pulaski, back to the north. 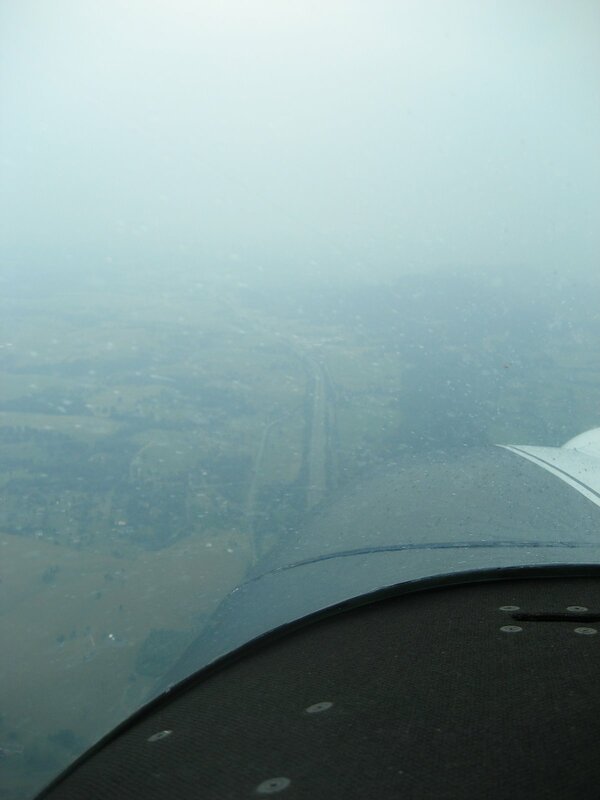 With rain streaming back over the windscreen, I stood the plane on its wing and made a u-turn back to the north and directly to Pulaski (KPSK). We had been fighting a headwind, seeing ground speeds of only 115-120 knots. The headwind became a tailwind as we headed toward Pulaski and the GPS reported ground speeds of 157 knots, about 180 miles per hour. Within just a few minutes we were approaching the airport. There was a stiff crosswind from the right, but to my relief I pulled off a nice landing, right wheel first. The automated weather reported a density altitude of about 4,100 feet, making this my highest landing yet! One of the benefits of a Tiger is the sliding canopy, which makes airplane operation on the ground MUCH cooler in the summer. The corresponding drawback is that when it's raining, you and the airplane get wet when you climb in or out. Imagine a convertible, where every time you want to get in or out, you have to put the top down! Leaving Millie in the plane for the moment, we jumped out, shut the canopy as quickly as possible, and ran inside. The nice man at the counter pointed us to the pilot's lounge, where a couple of older, local pilots were relaxing. I logged into the computer and looked at the weather. It did not look good, so Jodie and I asked about local options for food and entertainment. One of the locals replied, “Well, there’s a McDonalds and Walmart, a Mexican restaurant, and Shoney’s. That’s about it.” There was no loaner car, but the FBO did have a truck we could rent -- $11 for two and a half hours. We collected Millie from the plane and set off to explore the rolling hills and tobacco fields of Pulaski. 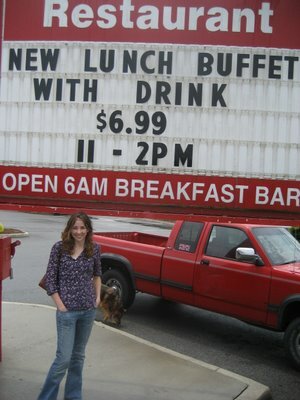 After lunch at Shoney's (my first introduction to the famous salad bar), we stopped at Walmart for a little shopping, then headed back to the airport, where we saw that the weather had improved enough for us to continue. We bought some gas, loaded Millie back in the plane, and continued south. The rest of the flight was uneventful. The clouds were low, and helpful controllers gave me vectors around several areas of heavy rain, but the Strikefinder never showed any lightning. Jodie slept for almost an hour, waking up as we were following the Holsten River toward Cherokee Lake where her parents' lake house sits. Millie stayed mellow, as usual. We flew over the lake at 500 feet, then climbed back up for the last ten minutes to Knoxville. 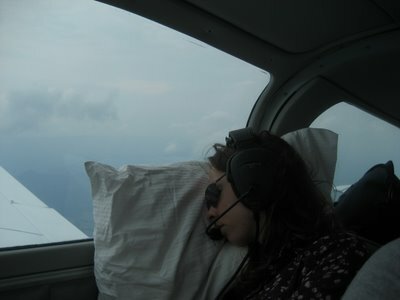 ATC directed us east to avoid some rain, which Jodie and I could see clearly from the plane, then lined us up on the French Broad River. "Two Four Four, are you familiar with Downtown Airport?" the friendly controller asked. "Negative," I replied. Although I took a flight from there once, it was several years ago. "The airport is just past the bend in the river as you're approaching the city," she said. The city was clearly visible a few miles away, and there were about seven bends in the river between us and the city. Then I saw the runway. "Knoxville Approach, Two Four Four has Downtown Island in sight," I said. 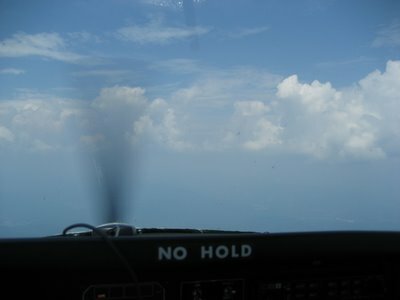 I was about 1,800 feet above the ground, only two miles from the end of the runway, and closing at about 120 knots. I could maneuver to fly a standard traffic pattern or I could land straight in. If I was going to land straight in, though, I needed to do something fast. At the speed we were traveling, we'd be over the airport in less than 60 seconds. I announced our position and intentions as I cut the power to idle and pulled the nose up to slow us down. As the needle on the airspeed indicator dropped into the white arc, I reached down and pulled the switch to add full flaps. The airspeed dropped as I pushed my right foot hard against the rudder pedal and turned the yoke to the left. The plane started descending steeply in a controlled slip at about 1,200 feet per minute. I pulled out of the slip and straightened the plane as we crossed the runway threshold at 70 knots and about 20 feet off the ground. The plane settled into ground effect and slowed, touching down smoothly at the thousand foot markers. We slowed to walking speed and turned off the runway as I slid the canopy back. The slowly spinning propeller blew the hot, late afternoon air over our heads. We taxied slowly to the FBO, savoring the feeling of a trip completed. It was our first flight to Tennessee, something I’d been anticipating for years. It was also our first trip in the Tiger, which had performed flawlessly. Jodie's dad walked out of the FBO to meet us as I parked and shut down the plane. He didn’t know we had bought a plane. Jodie jumped out and gave him a hug. "Do you like the plane?" Jodie asked. He replied that it seemed like a nice enough plane. "No. 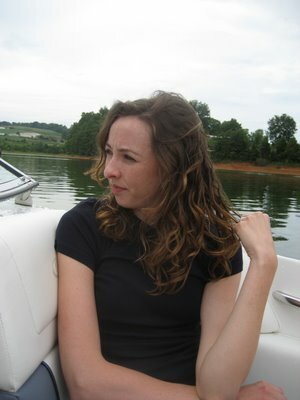 I mean do you LIKE the plane," Jodie said, a mischievous twinkle in her eye. We had a wonderful two weeks of swimming, waterskiing, sailing, shopping, eating, and enjoying the company of friends of family. Millie found all sorts of smelly things to roll in. Jodie and I both felt the accumulated stress of our urban lives melt away. At the end of two weeks, we were (almost) ready to go back and attack our jobs with new vigor. On the morning of the 18th we went to the airport with Jodie's mom and our trusty, freshly washed dog. We packed the airplane and took off to the north, climbing straight out. We detoured slightly west to fly over the lake once more, then continued on our course, climbing to 9,500 feet where the air was clear and cool. The Tiger purred steadily and smoothly, the iPod worked through a playlist of Waifs songs, and we touched down at Gaithersburg just three hours after we left Knoxville. That works out to an average of about 145 miles per hour. 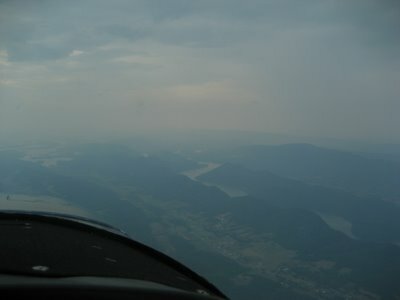 Hot and humid air filled the cabin as we descended into the haze. Along with the hot air came some convective turbulence. The Tiger's heavier wing-loading cuts through it, though, and the turbulence was not an issue until we approached the runway to land. With a crosswind and 100-degree temperatures, the Tiger floated and tossed on burbles of hot air. I was on the verge of deciding to go around and try again when the airplane finally settled to the runway with hardly a bump. We taxed in slowly, canopy slid back in the heat, mission accomplished. So Much Better Than Driving! The seller of our Tiger flew it with his wife from Maine down to Gaithersburg, Maryland yesterday. (Total time from startup to shut down was 3.3 hours.) 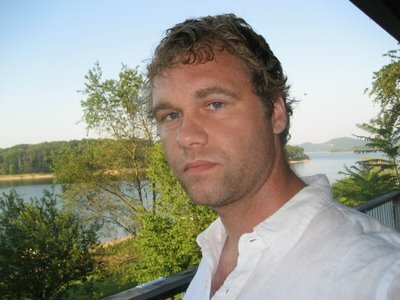 I met him at the airport and we had lunch while we exchanged paperwork. Then there came the point when he handed me the keys. My grin stretched from ear to ear, and so did his, although I knew he was sad to see it go. I drove the seller and his wife to Baltimore so they could explore the Inner Harbor before flying home to Maine, then returned to the airport. There's so much to learn! I explored the airplane from nose to tail, then drove to Home Depot to get some matching blue and white nylon tiedown ropes. I sat in the cockpit, turned on the master switch, and played with the radios. I had read all the manuals, but reading and doing are two different things, so I played until I began to worry about running down the battery. It was a beautiful evening, so I pulled out the Pilot's Operating Handbook and began reading while sitting in the plane. 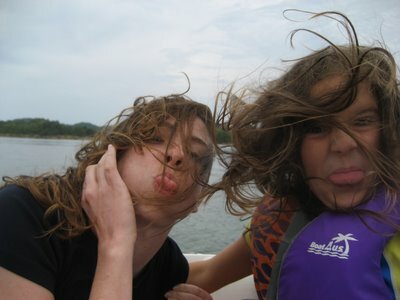 Then Jodie arrived with our friend Amy, who is also learning to fly. I climbed out of the plane and ran over to meet them. I delighted in showing Jodie every little nice thing about the plane, of which there are many. Jodie and Amy crawled all over the plane. Then a pilot-friend, Charlie, came by to see it. Charlie owns a Tiger and has over a thousand hours of experience flying Tigers. Under the terms of my insurance, I can't fly the plane until I get a checkout from an instructor that has experience in Tigers. Unfortunately, Charlie is not an instructor. BUT, my insurance will cover a pilot who has more than 300 hours total and more than 25 hours in Tigers. So I asked Charlie if he'd take us for a ride around the pattern, and he was more than willing. 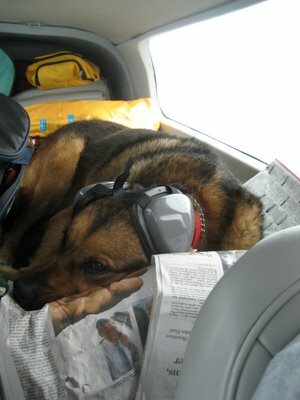 Charlie took us "around the patch" twice while I used the radio and generally fiddled with the avionics. The sunset was gorgeous and the air was silky smooth. Charlie has a deft touch with Tiger controls and gave us two good landings. Charlie left, but Jodie, Amy, and I stayed at the plane and continued talking about it. Then Rich, my friend and former flight instructor, came by with his dad and dawg. Rich's dad has tons of experience as a pilot, so both he and Rich admired the plane for a while.